Staff members from the MHA Keystone Center recently visited Helen DeVos Children’s Hospital in Grand Rapids to learn about its iHub, an innovative and multifaceted approach to performance improvement and the management and communication of quality improvement projects. The tour was facilitated by the hospital’s president, Bob Connors, MD. The iHub is an environment within the hospital that fosters collaboration among its healthcare professionals and enhances transparency within improvement projects and processes. Prior to the implementation of the iHub, Helen DeVos Children’s Hospital staff often felt siloed in various departments, and collaboration and regular interventions between departments were limited. As a result, improvement work was slower and less precise than desired. The iHub model is based on discovering the root cause of problems via the Plan Do Study Act process, a four-step method focused on problem solving and continuous change. It uses various quality improvement tools and methods in the identification of problems and the development of solutions, while allowing for open communication among departments. A weekly iHub huddle allows performance improvement staff, nursing and department managers, and executive and senior-level staff to provide regular updates on strategic goals, potential barriers and progress made on active projects. Updates are physically tracked on a bulletin board to highlight processes and outcomes and their influence on meeting goals in such areas as safety culture, patient care and overall experience. The entire effort, which has been in effect for a year and a half, has led to better and faster high-impact improvement work. 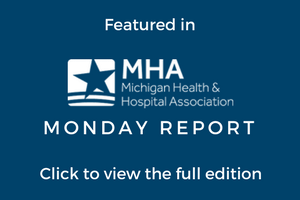 Lessons learned from the visit to Helen DeVos Children’s Hospital help inform the MHA Keystone Center’s collaborative efforts and its work on best practices in promoting the advancement of safety culture and quality improvement among all Michigan hospitals. For more information, contact the MHA Keystone Center. Photo Caption: MHA Keystone Center staff visit the iHub with Bob Connors, MD, president of Helen DeVos Children’s Hospital.